Happy Halloween Eve! I’m not dressing up this year — every year I have big plans to paper mâché a giant bunny head, or sew myself a Totoro suit, but inevitably I just end up looking at thousands of photos on Pinterest and end up making nothing. Nonetheless, I love Halloween and decided to dress-up some of my food in lieu dressing up myself. I’m a super-big fan of Totoro. If you have never seen the film, My Neighbour Totoro, I recommend it. It’s about two little girls who move to the country with their dad so they can be closer to their mom who is recovering at a nearby hospital. They discover magical creatures in their backyard forest and go on several adventures. It’s fluffy and fun, perfect if you’re feeling nostalgic about childhood. I’ve seen several Spam Totoros floating around the internet. There are some tutorials showing you how to create a template to cut out your spam, but I just winged it and did it freehand. 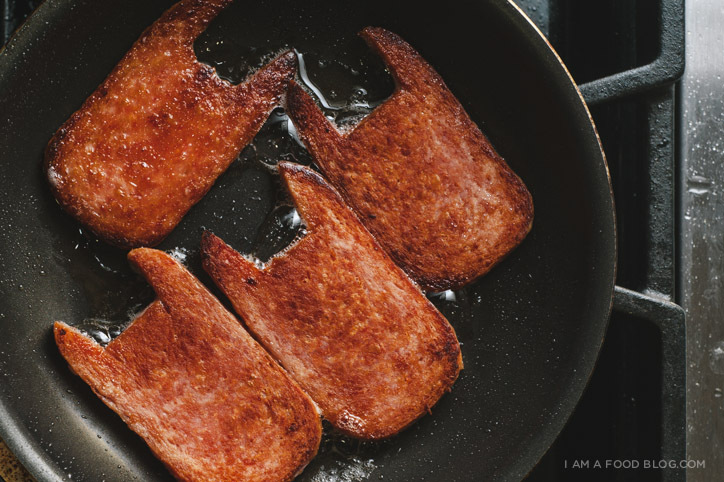 Spam is perfect for cutting out shapes. 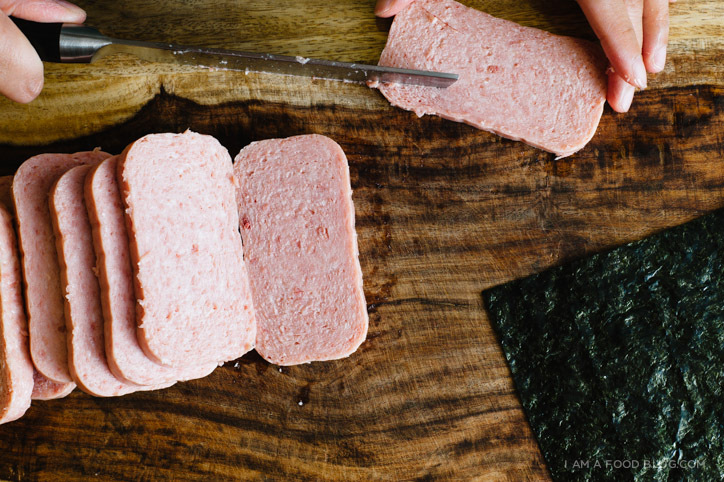 If you haven’t had spam musubi before you should try it – it’s pretty delicious. It’s basically a giant spam sushi. They’re super popular in Hawaii, where they originated. Usually the rice is seasoned with furikake, a Japanese seasoning and the spam is fried in a mix of soy sauce and sugar. I kept it simple and just used plain Koshihikari rice and plain fried spam. I thought they were plenty flavourful. Please don’t try this at home! Use an intact can with plastic wrap like in this video. 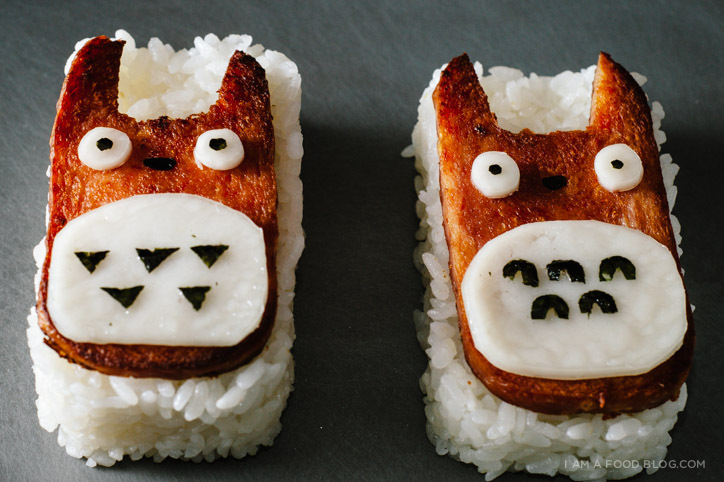 The Totoros turned out almost too cute to eat, but I ended up eating them anyway and they were delicious! Happy Halloween everyone! I recommend watching the video before making your Totoros. Also, I found it a lot easier to have all of my seaweed and cheese cut up before I even started frying my spam. Also, please don’t try cutting up your Spam can! I like to live dangerously, but really, using plastic wrap like in this video is better. 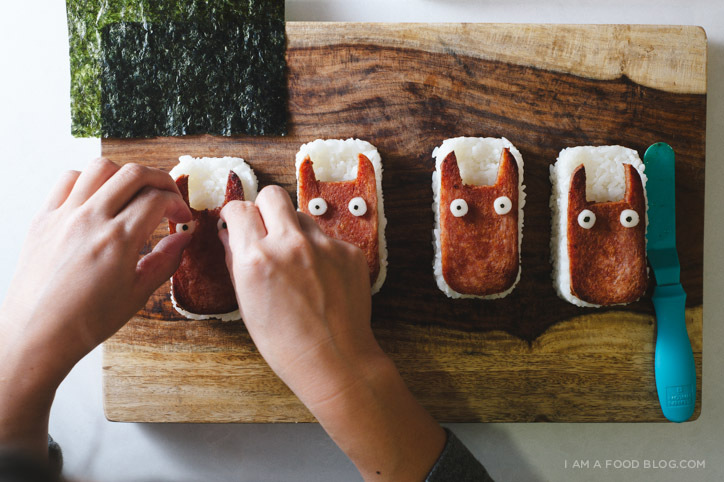 Trim the spam slices so your Totoros have ears. Fry both sides in a frying pan over medium heat until brown and crispy. 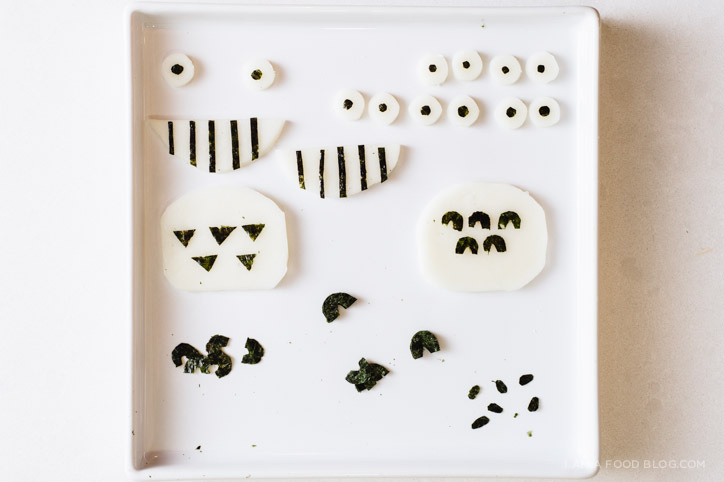 In the meanwhile, shape your rice. 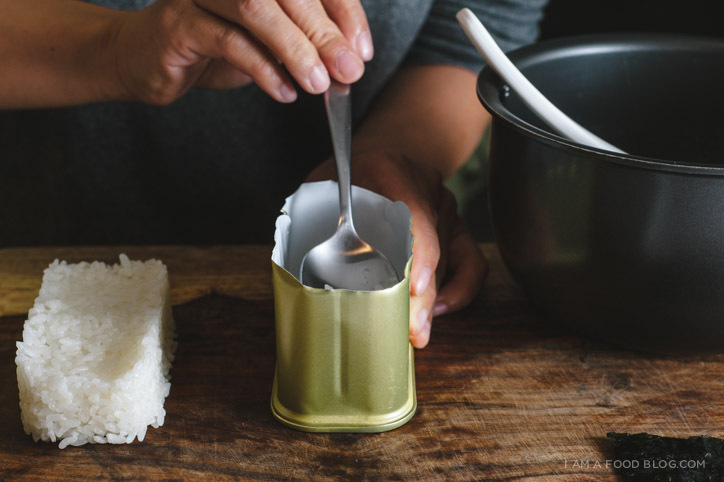 Don’t cut up your spam can like I did – just do what they do in the video and place a piece of plastic wrap into the can and pat down the rice. When the rice is compact, pull the plastic wrap up and you’ll have a brick of rice. 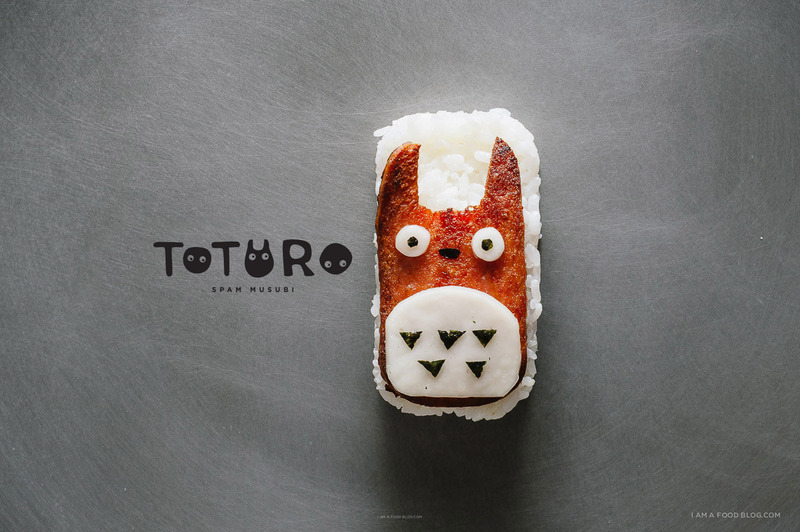 Top the rice with the cooked spam and Totoro face and tummy. Enjoy warm! OH MAN, I love that movie! These are so freaking cute! I am totally going to include this in my Japan Week round-up if that’s ok? Of course, thanks for including me! 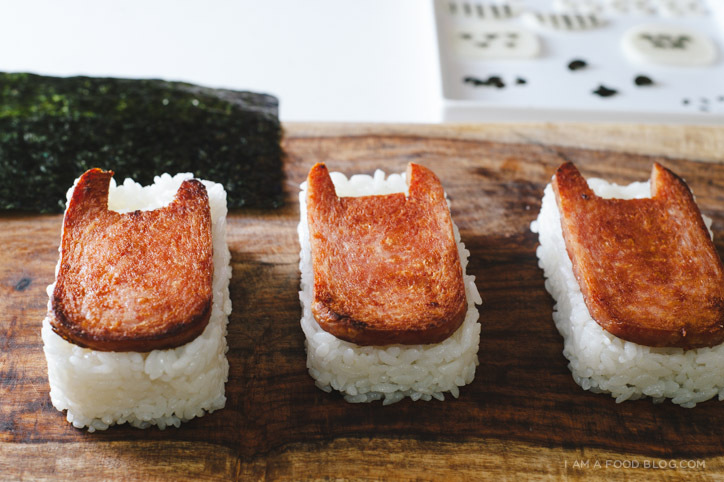 OH MAN, I love Spam musubi! I’m so happy for this recipe because the only place I know of to get it in our little town is terribly overpriced. But of course it isn’t complicated to make! And soooo cute. This is happening. I can’t! This is adorable! Uhh… this is the cutest thing EVER. I love it when you post; my Feedly practically bursts with excitement. 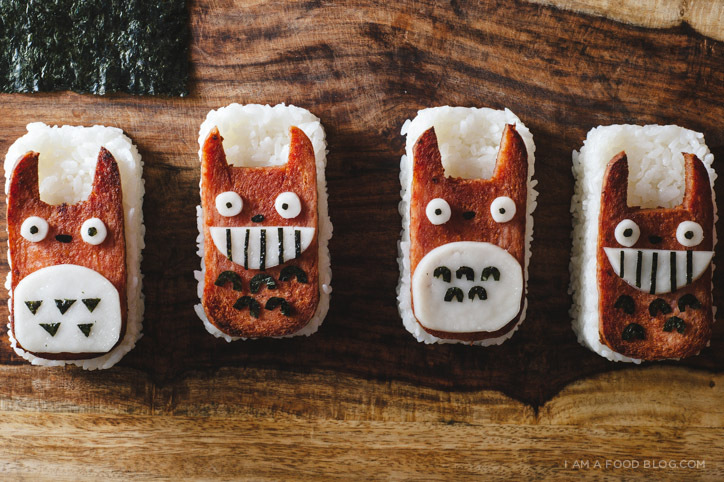 I’ve never had the patience/talent to make any remotely interesting rice “sculpture” for my bento, but this is just too awesome to pass up. Plus, I’d love to add Spam to my otherwise obnoxiously pretentious grocery cart. Oh my goodness, I cannot get over how cute these are. I LOVE totoro!!! ha ha ha these are so cute!! Love this! Kawaii! It looks delicious, kudos! That is just too cute! :D You have a lovely blog with very nice photos. tell me you became friends with Yuna from Kawaii Kakkoii Sugoi when you were in Japan. oh please!! 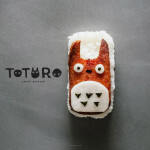 Combining my two loves :D totoro and spam! Is there anything I can substitute for the sea weed paper? When did spam reach Japan? Presumably not in Red Cross food parcels!